Frontier Developments' follow-up to their excellent wind-powered WiiWare launch title LostWinds returns gamers to the magical land of Mistralis. Combining the breezy charm and engaging puzzling/platforming formula of the original with a few game-improving tweaks, LostWinds: Winter of Melodias manages to surpass its predecessor with style to spare. Waggle the Wind: As with LostWinds, the core gameplay of the sequel involves controlling Enril the Wind Spirit so young protagonist Toku may succeed on his quest. And, once again, Frontier has managed to do what so many other Wii game developers have failed at: Creating truly intuitive WiiRemote motion controls. Toku is still navigated left and right with the Nunchuck's analog stick, while the WiiRemote handles wind and other weather-based trickery. From conjuring simple gusts to elevate Toku, to combining several gestures for more complicated puzzle-solving moves, you always feel in control of the simple swiping moves. Where other-more expensive games-continue to frustrate, Winter of Melodias puts fun first by making good on the hardware's original promise of allowing us to enjoy games in a whole new, innovative way. Calming and Charming: Not since the PSN's Flower whisked me into its serene settings have I experienced such stunning, soothing visuals. The original game's sun-soaked settings were similarly serene, but the sequel even tops those by adding beautifully rendered wintry environments and effects. From falling flakes to sparkling icicles, the winter wonderland-like atmosphere matches the lush vegetation and bubbling waterfalls of the summer-set areas. Additional touches, such as Toku being realistically refracted when standing behind ice, will make you forget you're not experiencing a full-on retail release. Modest, yet equally engaging music and audio effects complement the strong visual presentation. Change of Seasons: The addition of ice and snow to Toku's world offers more than just a pretty new paint job; it's also the source of the game's coolest new play mechanics. Early on, you'll use Enril's mastery over Mother Nature to keep Toku warm by lighting heat sources, and later, you'll be able to conjure cyclones to best baddies, blast blocked passages, and solve puzzles. Coolest of all, though, is the ability to actually switch seasons. Going from winter to summer, and vice versa, proves an endlessly engaging mechanic that's needed to crack some of the more complex parts of Toku's quest. Gusting water from a summer lake into a cloud, then raining that same precipitation into a winter void to create a solid, icy path, is just one example of the season-changing fun. Retaining the endless charm, stunning beauty, and seamless control of the original-while also mixing in some amazing new abilities-this platforming puzzler sequel not only surpasses the original, but is also superior to many retail releases. In fact, if it weren't for LostWinds: Winter of the Melodias' short length (about 4-6 hours), you'd easily forget this one came from the WiiWare channel, and not your local EB Games. 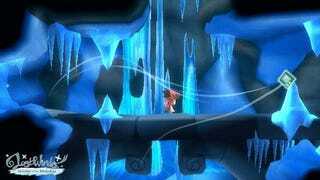 LostWinds: Winter of the Melodias was developed and published by Frontier Developments for WiiWare on October 19th. Retails for 1000 Wii Points. A copy of the game was purchased using WiiPoints provided by Nintendo of America for reviewing purposes. Completed game.